Welcome to my first Wishful Wednesday post! I spend a good deal of my free time looking at magazines, websites, and fabulous design blogs. I am constantly lusting and wishing for items I see. I swear, I have spent all of my imaginary lottery winnings several times over. 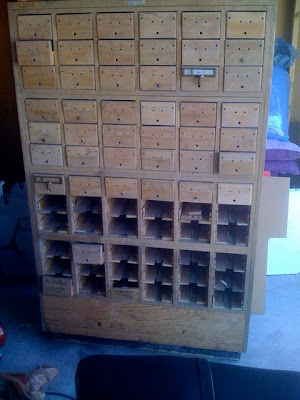 One item I have been wishing for is a card catalog. I have been looking for one forever to refurbish - but so far, no luck. 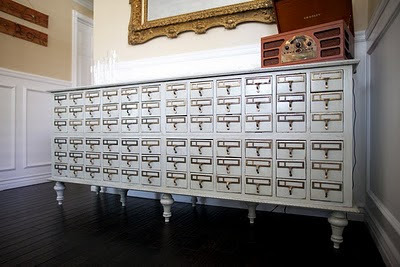 Check out Adrienne and Jeremy's Card Catalog Makeover... Swoon! You can see their entire transformation at their blog, Dream Book Design. So inspiring! Check this one out! It is used to hold wine bottles... GENIUS! I can think of 100 ways to use one. My Craigslist Quest continues. I WILL own one of these one day. p.s. Have you heard of Craigseasy? I.AM.OBSESSED! If you search Craigslist often, you will LOVE Craigseasy! Check it out! Trust me, it will change your life. 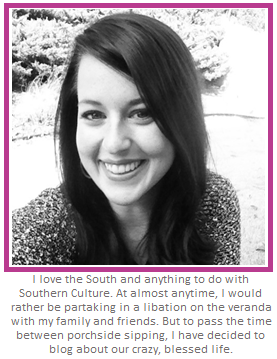 Thanks for reading my very first Wishful Wednesday post! Talk soon, friends! What a clever idea for a wine rack. Good luck with your search! thanks for the feature! 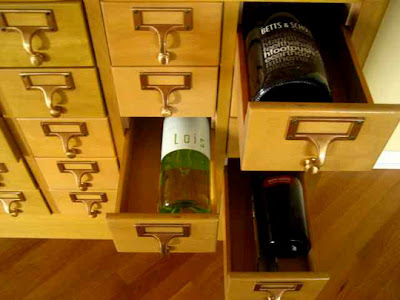 we use ours told hold wine, and other things (considering theres over 70 drawers!). I hope you find one soon! this would be a great piece keep looking, you will find it. Craftaholic Gift Exchange - YAY!